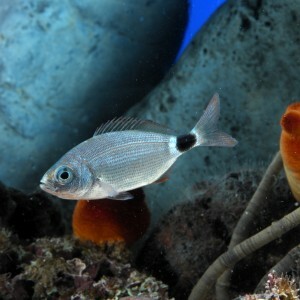 The saddled bream’s body is long and compressed with a curved dorsal and ventral profile and a highly marked side line. Its mouth is small and it is found facing forward with extendable jaws. The colour is blue-grey with a silver back. Its most characteristic trait is the black stain it has on either side of the caudal fin, surrounded by two white rings. Its maximum size is 20 cm. This fish is gregarious and swims in large schools close to the surface. It is a highly voracious fish with varied feeding habits: planktophageus and omnivorous. It eats algae, crustaceans, molluscs and fish. It is an oviparous species that lays its eggs between April and July. It is a simultaneous hermaphrodite (with two sexes at the same time). It is an animal that prefers shallow waters (from 3 to 30 m) with a rocky bed, close to the coast. It is found in the Mediterranean, the Atlantic and the Bay of Biscay. The saddled bream is a fish that is caugh commercially, particularly in spring and summer.